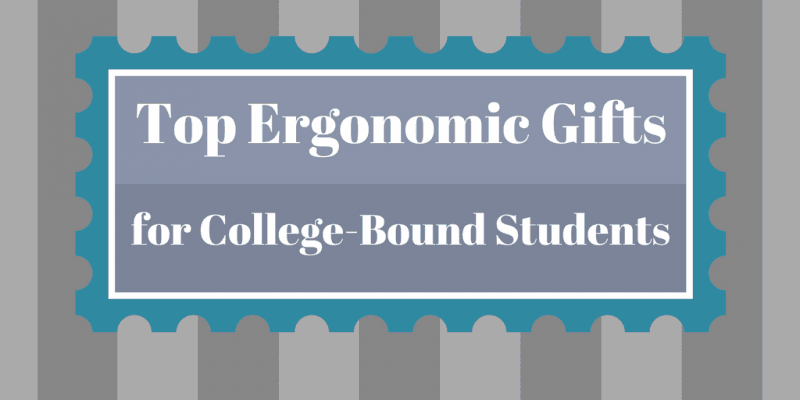 Want to give the best ergonomic gifts to a college-bound freshmen? Start them now on ergonomic devices. Imagine how much computer time your college-bound freshmen are going to have for the rest of their lives. If a couple of ergonomic devices get them started with good device usage habits, your gift will keep on giving. 1. Help them reduce mobile phone and devices related injuries. Good luck with this one. When I was a freshman I would not have taken any of this advice. This book on RSI prevention for mobile device use may be the best option to help them avoid future injuries like Thumb Tendonitis (“Blackberry Thumb”), Carpal Tunnel Syndrome, and Wrist Tendonitis. One reviewer of this book said “I was totally shocked when reading this book. I am doing so many things wrong. No wonder I keep having neck pain and arm pain.” If your college-bound student is open to something more active, you could also try a back brace corrector. Even if they don’t read the book or use a brace, you may be the first person to share a message that their mobile device use could end up hurting them for the rest of their lives. 2. Get them a good ergonomic keyboard. Be careful with this one. Some keyboards only work on Windows machines or Macs for instance. If they are using a Chromebook, chances are the Windows version may work fine but the Mac version may not due to some specific Mac keyboard keystrokes hard coded into keyboards. 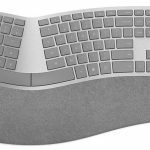 Your best overall bet for a keyboard is the Microsoft Surface Ergonomic Keyboard. It’s made for Windows, works great with Chromebooks, and for the most part works great on Macs (labeling is off on control keys but your student will figure that out quickly). Plus, it’s wireless and looks pretty cool with felt. I would stay away from the Microsoft Surface Mouse that is usually recommended with this keyboard. 3. Get them a good ergonomic mouse. We have a bunch of mice here and alternatives to mice. To keep things simple, you can’t go wrong with the Logitech MX Master. Like the keyboard, you can connect via Bluetooth. Chances are your student’s computer may not have a free USB port and no way they are going to want a wired option! 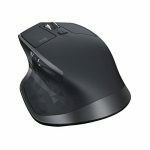 This mouse in particular we recommend because it should work fine across Macs, Windows, and Chromebooks. This mouse is also very customizable so your student will find ways to set it up however works best for them. 4. Get them a stand up desk, sort of. This portable, cardboard system unfolds into a stand up desk that will convert whatever desk/table they have into a stand up desk. It comes folded up so won’t take a ton of space. They are likely going to sit for hours and hours in lectures and labs. Give them the gift of standing. If you are curious, google the benefits of a Stand Up Desk. I won’t bother. You’ll find an overwhelming amount of good information. 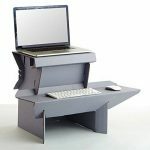 This pop up desk is about $30. We recently completed a review on a full sized Stand Up Desk that is closer to 4 figures. 5. Get them a stand up desk chair or wiggle thingamajigger. Don’t stop with just a stand up desk. You can get a Mogo Stand Up Seat. Or you can just get them a rocker they stand on which helps them move a bit more. They will likely have limited personal space so both of these options easily hide under a bed or desk to streamline a room. 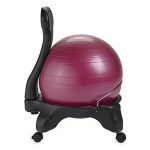 If you must get a chair, consider a balance ball chair or a kneeling chair. 6. Get them a game to get off of devices. As an ex-Peace Corps guy, I would advise games that are cooperative and wholesome. But as an ergonomic recommendation, you have to make sure if you give a game that is intended to get your student off of electronics and with other to play, it has to be something they would like. 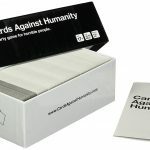 I didn’t like the concept of Cards Against Humanity but boy is that card deck super popular with incoming students. That deck will most certainly get your student and some friends to take time away from electronics. Personally I’d try to give the Forbidden Desert game. It’s fun and to win you have to cooperate! 7. Get them a pair of video game glasses. I personally have the Gunnar Optiks model and love it. They are going to be staring at screens for hours on end. Why not stare through something that can help take the edge off a bit. As the Gunnar website states, naked eyes are not designed to stare at digital screens and artificial blue light. 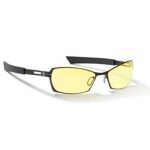 A good pair will help defend against eyestrain. Hope this list helps you find the perfect ergonomic gifts!